Male; Graduate of any vocational course or at least college level, Previous experience in warehousing, handling inventory, and bar code equipment, Must have great organization, communication and time management skills, With good moral character, Articulate and has good communication skills, Exhibits strong sense of professionalism, With pleasing personality. Male; Have finished at least 2 years in college, Experience in mechanical works is an advantage, but not necessary, Willing render overtime, Willing to be detailed outside the office and yard. Female; Must be a college graduate, Physically fit, honest and hardworking, and at least have knowledge in sales, purchasing and also accounting job. Female; With at least 1 year experience, at least high school diploma, good presentation skills, flexible, willing to work on weekends, with excellent communication skills. Male; graduate of HRM/ Culinary or any related course, with 1 to 2 year practice, has basic expertise of tasks such as inventory management, over all kitchen operation, expertise in dealing with sanitation and safety procedure in kitchen for restaurant operation, TESDA certificate is an advantage. Candidate must possess at least College degree in Accountancy, At least 1-2 years experience in related field, Familiarity with bookkeeping and accounting procedures, processing of employees benefits, payroll, financial statement, inventory, Must be well organized, Honest & Trustworthy. Female; With or without experience, 5’4” height, Passion for hospitality Excellent customer service, With pleasing personality. Female; At least 1 year experience, Impressive bar cocktail program, With pleasing personality, Excellent customer service. At least 2 years experience, High level of professionalism, Comfortable working with a team in a fast paced kitchen environment, Excellent verbal communication and organization skills. At least high school graduate, With or without experience, Hardworking dependable and with initiative. Male/Female; College graduate (BS in Accountancy), with or without experience preparing Financial Statement and government remittances, Can work under pressure and with minimal supervision, Willing to render overtime. With or without experience, Average/excellent English Communication Skills, Good communication skills, Focused and Determined, Computer literate and can do multi-tasking, Can work under minimal supervision, Can work under pressure, At least High School Level. Candidate must possess at least a Bachelor’s/College Degree in Business Studies/Administration/Management, Economics, Marketing, Commerce, Mass Communications, Administrations, Advertising/Media, Humanities/ Liberal / Arts or, equivalent, Required skills driving, verbal/written communication, leadership/sales skills, Fresh graduates/entry level applicant are encouraged to apply, Those with relevant year(s) of sales and marketing experience not limited to automotive dealership is an advantage, Full-Time position(s) available. Candidate must possess at least a Bachelor’s/College Degree in Finance/ Accountancy/ Banking or equivalent, Preferably 5 years experienced employees specializing in finance-general/cost accounting or equivalent. Job role in finance accounting & reporting or equivalent, Knowledgeable in office and administrative procedures and practice, Proficient in MS Word & Excel, Good time management, Must be detail-oriented. Candidate must possess at least a Bachelor’s/College Degree in Finance/ Accountancy/ Banking or equivalent, Preferably 1-4 years experienced employees specializing in finance-general/cost accounting or equivalent. Job role in finance accounting & reporting or equivalent, Knowledgeable in financial analysis, accounting principles, system & procedures Knowledgeable in office and administrative procedures and practice, Proficient in MS Word & Excel, Good time management, Must be detail-oriented. NC II Certificate, Possess a valid non-professional driver license. College Graduate, With or without experience, Skills in inventory, communication (Oral and Written), computer literate, Team player and can work under pressure. Preferably a licensed Mechanical Engineer, Knowledge in MS Office (Word & Excel), Ability to handle multiple task, Possess a valid professional driver’s license. Male; Graduate of 2 years preferably HRM or its related course, With good scholastic records, With good moral character, With computer background and typing skills and proficient in oral and written communication. Male; At least high school graduate, With or without experience and physically and mentally fit. 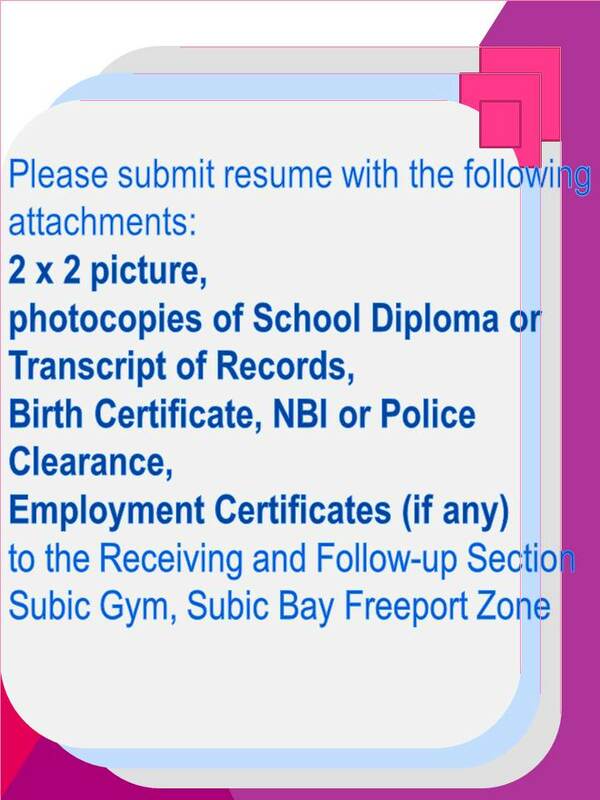 TAKEN), PHOTO COPY OF BIRTH CERTIFICATE, SCHOOL DIPLOMA OR TRANSCRIPT OF RECORDS, PROOF(S) OF WORK EXPERIENCE(S) AND NBI / POLICE CLEARANCE AT THE RECEIVING SECTION OF THE MANPOWER SERVICES DIVISION- LABOR DEPARTMENT, SUBIC GYM.